NHS. Not the Messiah, Just a Mess. Our National Health Service just turned 70! 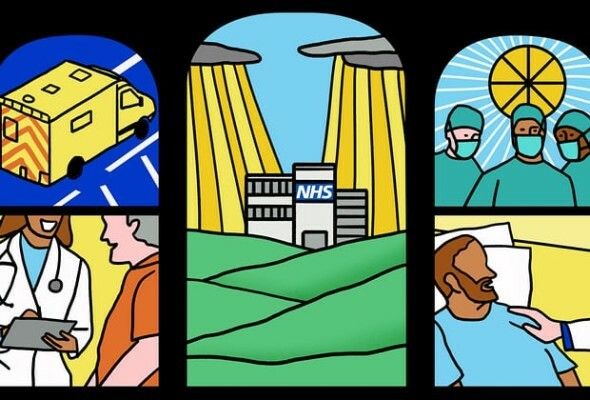 According to a recent article in The Guardian by Polly Toynbee, The NHS is our religion in the UK and that’s why the conservative government can’t destroy it. Of course, the Conservative government have never actually tried to destroy the NHS. They haven’t even reduced the amount spent on the NHS. They haven’t even halted increases in healthcare spending. The only thing they have done is reduced the rate at which spending is going to continue to increase. 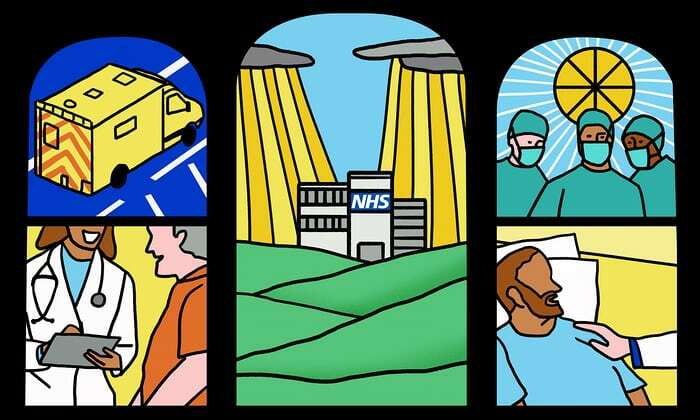 Before the National Health Service was created in Great Britain our nation was a world-leader with an unrivalled record in making major medical breakthroughs. People came from all over the globe to study medicine, and to be treated in the UK. Dr. John Snow proved that the source of cholera epidemics was the water supply in London. Edward Jenner pioneered a vaccine for smallpox in rural England, and Sir Almroth Wright one for typhoid. Sir Humphrey Davy, also a Briton, first suggested the use of nitrous oxide as an anaesthetic in 1800. Sir Joseph Lister pioneered the use of antiseptics in operations in 1865 using impure carbolic acid, saving countless people dying from infections after surgery. Alexander Flemming, the Scottish physician discovered Penicillin in one of the charitable hospitals in London in 1928. Howard Florey and Ernst Chain, brought it to fruition working in a laboratory in Oxford in 1941. Britain had established the best record in the world for achieving major medical advances and had just developed the landmark drug of the 20th century, as well as playing a leading role in 5 out of the 7 leading medical breakthroughs between 1750 and 1948 when the NHS was established. Britain is no longer a leader in medical advances. Despite its costliness, nepotism, and other flaws America’s private system has taken the lead. Britain has less of the latest equipment and the old equipment is often being kept beyond the time when it is safe. If a private company was using out of date intensive care machines and x-ray machines, obsolete cancer care equipment, and operating tables over twenty years old – double their safe life span – the champions of the NHS would no doubt be clamouring for more government oversight and regulation. When government agencies are culpable, they are more or less given a pass on public outrage because they are perceived to be acting in the public interest rather than for profit. In the UK we cannot compete with cancer survival rates in the US. A 2011 report demonstrated that the average cancer survival rate was 71.18% in the USA as compared to 54.48% in England. Our healthcare may be free at the point of service, but fewer of us survive it. It is costly in terms of lives. In fact, the BBC recently ran an article that reported “patients ‘dying in hospital corridors’.” In one month 300,000 patients were made to wait in emergency rooms for more than four hours before being seen, with thousands more suffering long waits in ambulances before even being allowed into the emergency room. The sad reality is that in the UK or Canada people die waiting in line for what would be quick and routine medical treatments in the US. In Britain a shocking 4 million people languish on waiting lists according to official sources up from a 7 year high of 3.4 million in 2015 as reported by The Guardian, a left-leaning newspaper, and this in a population of scarcely over 65 million. At current trends this number is set to rise above 5 million in 2019 unless we do something to reverse them. 25% of British cardiac patients die waiting for treatment, and an investigation by a British newspaper found that delays in treatment for colon and lung cancer patients have been so long that 20% of cases were incurable by the time they finally received care. 193,000 NHS patients a month wait beyond the target time of 18 weeks for surgery. According to the OECD Britain has the lowest number of doctors per thousand population in the advanced world. A chart displayed in James Bartholemew’s book The Welfare State We’re In in 20 documented that while only 1% of patients of patients in the USA had to wait over four months for surgery, while the number was 12% in Canada, 17% in Australia, 22% in New Zealand, and a shocking 33% in the UK. Where free-at-the-point-of-entry resources are limited older patients are viewed as a drag on the system – especially since they require the most frequent care which costs much more. The average 65-year-old costs the NHS 2.5 times more than the average 30-year-old. An 85-year-old costs more than five times as much. Although a third of all diagnosed cancers in the UK are found in patients seventy-five and over, only one in fifty lung cancer patients over seventy-five receives surgery, and the NHS does not even provide cancer screening to patients over the age of sixty-five. The failings of socialised medicine are invariably blamed on budget cuts and a lack of funding by advocated of the NHS who are used to expecting medical services to be paid for by the government. The assumption is that if we were just spending more money none of this would be happening. The thing is, we are spending more money than ever before already. 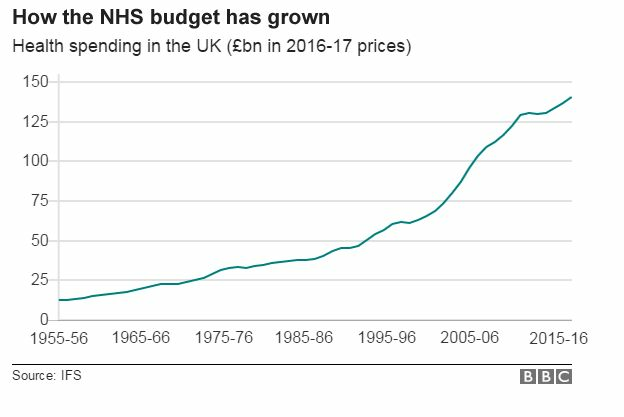 In fact, the budget of the NHS doubled in real terms between 1995 and 2015 and now waiting lists are longer than ever! This is because the shortages and inferiority of services are not caused by a lack of funding in the first place. They are caused by how we are choosing to pay for healthcare. Author Unspecified (2015) “Health Spending”, The Institute for Fiscal Studies. Antony Sammeroff is a writer, blogger, and counselor from Glasgow. He co-hosts The Scottish Liberty Podcast and is on the constitutional committee of the Scottish Libertarian Party and is their spokesman on the environment and economy. 3 Comments on "NHS. Not the Messiah, Just a Mess." which shows the extent to which the service is run for the staff and not the patients. On the subject of Brexit, I find it delicious the number of people who claim to be pro-European who recoil in horror when an SHI health care system is suggested to them to replace our NHS system which is a bit of an outlier in Europe. Not so pro-European after all.